The most noticeable matter re the Tongariro River and its catchment is how quiet it is with very few anglers about. It’s not because there are no fish in the river for there are. It’s not because the fish are disappointing for quality and size for they are of good size and quality. It’s not because of the weather as it is Autumn and to date we have had only two very light frosts though this might be queried by some. As I write it is windy outside as it has been all day since 10.00am but until today it has been calm. A full moon has risen in the past hour or so. In short, conditions have been very good for anglers. Perhaps it has been too bright making the catch hard for anglers but the few anglers I have talked to have caught fish. Its interesting to see the carparks around the river empty. A selfish enjoyment is having the river to oneself. The Never Fail with fallen tree t the top of the pool. The enticing Admirals Pool. Beautiful but hard to get to and hard to fish. The next change will be when this section falls into the river. Fishing aside, Waikato Regioal Council is working on repairing the riprap on the right bank 100 meters downstream of State Highway bridge. There is evidence of maintenance work on the area cleared of willows last year. The DOC fishery team are working to implement key recommendations from the review carried out in 2012. I understand that a key matter is online licenses. I hadn’t considered the extra work involved when an angler doesn’t have their license on them when a check is being made. Most anglers have their cell phone with them on the river and how convenient it is if you have a photo of your license on your smartphone. There are advantages in online licensing for DOC staff. If you have bought a license online then DOC staff can check for your license on their smartphone. I look forward to the implementation of online licenses when such a system becomes available. A couple of new fishing systems have been observed on the river. One is known as Czech or French nymph fishing. The technique involves the traditional fly rod and reel but the line is simply nylon and depends on weighted nymph to project the line. The line, when retrieved, falls on the ground and then to cast is simply flicked out through the line. The technique can be viewed on You Tube. Questions are asked if this should be an accepted form of fishing. I have not seen this technique in action yet and have no opinion on the matter. I do recall the issues involved with the introduction of weighted nymphs, 3 flies or nymphs becoming legal techniques, and jigging on the lake. The other technique is Japanese fishing in which there is no running line. The angler has the line attached to the rod and when the angler hooks a fish the angler runs up or down the river to play the fish. I’ve had to follow a strong fish on a running line but would be concerned if another angler with a fixed line was running up and down the river bank. I understand it has been seen on rivers elsewhere in NZ. In both cases the question is whether these are acceptable techniques in this fishery. I was interested to read in the Dominion Post a report from the UK that Didymo was not recently introduced to NZ as it has been here all the time. Having just read Bill Bryson’s ‘A short History Of Nearly Everything’ it seems strange things have happened but in this case I think it a case of bad science. The danger is that we become complacent and forget or don’t CHECK CLEAN DRY to keep the rivers for future generations as we find them today. I had an interesting chat with a shopkeeper in Arrowtown at Easter who told me that he thought Didymo was disappearing in the South Island. I wasn’t fishing in the South Island but I certainly saw Didymo and I would hope that all anglers and water users would make every effort to maintain the North Island Didymo free. I have had the pleasure of observing Blue Ducks on the river. Fishing the Hydro Pool at dusk I had the experience of a Blue Duck flying up river seemingly at head height whistling its way upstream. The following day a sole Whio was feeding on the Left bank of the Breakfast Pool. A day later I had the company of a pair at the Kamahi Pool. I told an interested member of my sightings and his question was are they increasing in numbers? I can’t say but I was pleased to see them in two locations reasonably close on the river. The same person told of seeing a group of Mallard in the area of the Major Jones Pool when a Blue Duck arrived and immediately attacked the Mallards causing them to take flight. The efforts on behalf of saving the Whio seem to me to be having a good effect. 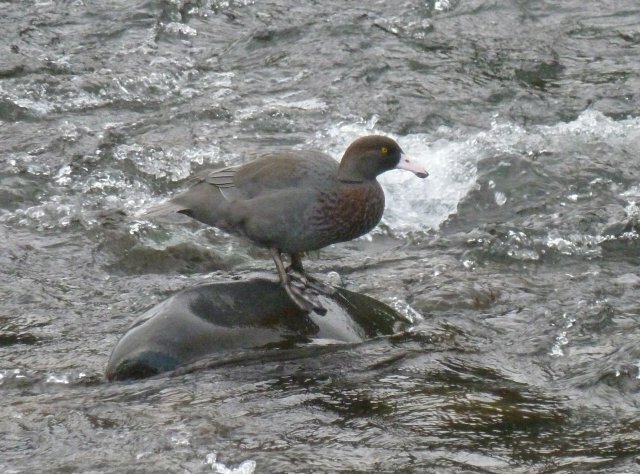 It was sad to learn last year that a Whio was Killed by a dog within the town. Our membership is important and we hope that you will support us. Thank you to those who have paid their subscriptions and a gentle reminder to those still to pay your subscription that we welcome your support. Our Annual Meeting to be held at the Bridge Lodge on Saturday 29th May, 10.00am We hope that you can attend and we would welcome new members on the committee. We look forward to seeing you at the meeting.